Sponsored by Dr. Adnan Otom Vice President for academic affairs of Al Yarmouk University in the presence of Dr. Ryad Almomani Dean of Faculty of Economics and Administrative Sciences and during a ceremony held on this occasion, Special Systems graduated the faculty members who participated in the workshop “eTrade & Order Management Simulated Systems” which was organized by Special Systems and the Banking & Finance department at the faculty of economics in Al Yarmouk university. Mr. Anas Ramzi, Deputy General Manager at Special Systems made a briefed speech presenting the company that is considered the first and the leading Arabic-Jordanian company in the field of automating the investment and brokerage firms operations who provided a simulated Academic version of the eTrade & Order Management systems for universities and colleges in order to bridge the gap between theory and application and meet the needs of schools of finance and management. Mr. Anas has also thanked Al Yarmouk University for being among the first academic institutions to implement the systems in its laps, indicating that OMS systems are applied in all the brokerage and investment firms and banks which provide the qualified students with job opportunities at these organizations and the exchange market institutions. At the beginning of the ceremony, Dr. Ziad Zureikat Head of Banking and Finance department at the faculty of economics referred to the importance of holding such courses for the faculty to be able to bridge the gap between theory and practice through teaching such systems in different modules as “Investment & Investment portfolios”, and “Financial Markets”, and through the implementation of simulated systems to provide the students with the required skills to make them eligible to enter the labor market. 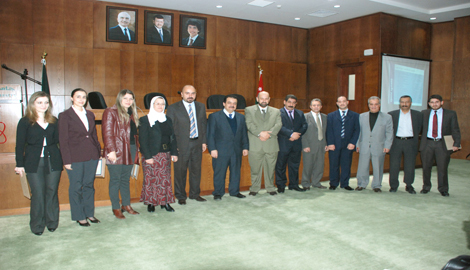 At the end of the ceremony Dr. Otom handed Special Systems’ certificates to the participants of the faculty members.